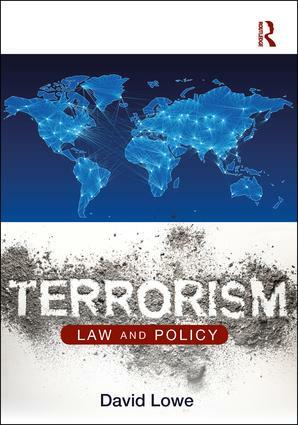 Terrorism: Law and Policy provides a comprehensive socio-legal analysis of issues related to terrorist activity. Aimed at both undergraduate and postgraduate students, the book takes a comparative approach to the law related to terrorism in a number of states, mainly those in Europe, North America, Australia and New Zealand. Beginning with an examination of the background to various currently active terrorist groups, the book focuses on those groups which are currently active and which pose a threat to security, especially at the international level. The chapters take the reader through the legal definitions of terrorism contained in various states’ statutory provisions and examine how the courts have interpreted terrorism in those states’ jurisdictions. The main aim of any terrorist investigation is prevention and so the book examines the various statutory preventative measures that states have introduced and explores the legal issues surrounding surveillance, terrorism intelligence exchange, radicalisation, use of social media, quasi-criminal provisions, asset-freezing and the nexus between terrorist activity and organised crime. Bringing together a number of themes related to terrorism and security from a uniquely legal perspective, this book builds a comparative picture of the legal counter-terrorism interventions states are adopting to increase co-operation and adopt a more united approach in the face of the international terrorism threat. David Lowe was a police officer for 27 years, and had numerous uniform and CID roles before retiring as a Detective Sergeant. During his police career, Lowe studied for a BA in Criminal Justice, an LLB, an MPhil that addressed the role of the police in a multi-agency approach to crime control and a PhD exploring the role of the UK’s Special Branch in counter-terrorism investigations. Following his retirement from the police, David entered academia, and was a principal lecturer at Liverpool John Moores University’s Law School until 2017. His research has resulted in many publications, including books, book chapters, articles in peer-reviewed journals and online journals. After leaving Liverpool John Moores, David set up his own terrorism and security consultancy business providing an expert witness service and advice on law and policy in the areas of terrorism and security, criminal law and policing. In addition to this, David continues to write in his research areas. David has provided commentary on these areas for the BBC, Sky News, ITN News, Al Jazeera, Al Arabyia, France 24, DW Germany, TRT, RT, ABC, CNN and CNBC. He is also a frequent contributor to radio and print media, including the BBC, LBC, TalkRADIO, Sputnik Radio and Newstalk ZB, Guardian, Daily Mirror, Daily Express, Washington Post, Wall Street Journal, San Francisco Times and New York Times, Slovakia’s Pravda, Spain’s La Razon and Austria’s Die Presse.